iStock by Getty Images is a leading global stock media provider of over 75 million high-quality licensed images, videos, and music. Moovly is an official partner of iStock by Getty Images. Thanks to this partnership, you are able to import premium-quality images, videos from Getty Images right into your project in Moovly. The millions of premium Getty Images media assets in Moovly will help you to illustrate your story whatever the subject matter is. As the following video explains, you can directly search and use new Getty Images objects while creating your video, or if you already have a Getty Images account you can connect that to Moovly and use any formerly purchased items. You can find the Getty Images. 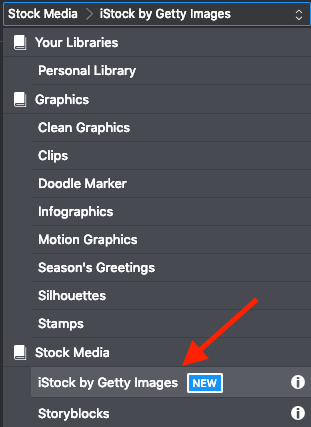 in Moovly Studio by selecting ‘iStock by Getty Images’ from the drop-down menu on the top left side of the editor. While creating your project, you are not required to purchase the Getty Images items you are using: you only have to pay for the objects you used when you decide to download or publish your video. So you can decide later whether or not you’d like to keep the objects used. In the meantime, your Getty Images objects will be watermarked with the Getty Images tag. Once you have purchased these objects, the Getty Images watermark will be removed and you'll be able to use them in any other Moovly projects.